Joey Palfreyman, older brother of Lee Palfreyman, already played 2008 and 2009 on the PDC Circuit. 2012 he took part for the first time in PDC Qualifying School but didn't manage to secure himself a Tour Card. As Associate PDPA member he played all UK Open Qualifiers and qualified for the tournament but was eliminated already in preliminary round. In 2013 he again took part in Qualifying School and this time on the fourth day got himself a Tour Card. He now plays the complete PDC Circuit. 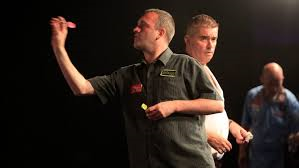 During the qualification for the Gibraltar Darts Trophy he threw a nine-darter. He again qualified for the UK Open but lost fourth round against Raymond van Barneveld.